Declaring any kind of straight LC tank circuit to be high stability is a bit of a stretch when compared to the Q available simply by adding a crystal, even in 1958. Tone modulation was an early method for achieving remote control of model airplanes, boats, and cars. The number of channels with these tone modulation systems is two times the number of modern proportional systems in that moving the rudder left took one channel and moving it right took another. Up and down elevator likewise took two channels. Therefore, this four channel system is only two channels by today's terminology. Technology evolved into fully proportional systems on crystal-controlled 27 MHz using pulse position modulation (PPM), then to 72 MHz, and today nearly every every R/C uses a combination of frequency-hopping spread spectrum (FHSS) and direct-sequence spread spectrum (DSSS) in the 2.4 GHz ISM band. 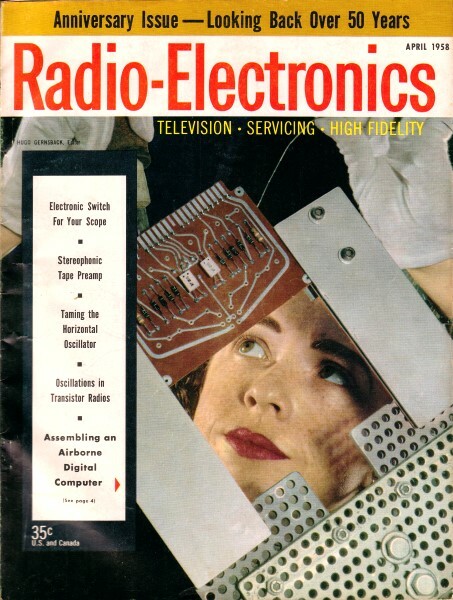 By E. L. Safford, Jr.
One of the most perplexing problems facing the R-C enthusiast when he turns to a tone-operated system is the construction of an oscillator that will provide the various frequencies accurately and with long time stability. The tone modulator described in this article is an answer to the problem. It not only provides the tones but also a method of modulating the radio-frequency oscillator. Fig. 1 - Four-channel two-tube 6-meter R-C rig. The circuit is a modified Hartley oscillator using a standard (push-pull plates to voice coil) audio output transformer as its tapped inductor. The size or type of this transformer is not critical and its wattage may vary from 2 for a battery-operated system to 10 for a system using a 6V6 as the oscillator-modulator tube. The latter will modulate a 5-watt carrier adequately. One end of the primary winding is connected to the plate, the center tap to B-plus and the other end to the stabilizing element which is a series-resonant circuit. The screen is connected to B-plus and the cathode is grounded. The theory of operation is simple. The transformer provides feedback necessary for oscillation, but the series-resonant circuit prevents all frequencies from being impressed on the grid except the resonant frequency of the tuned circuit. In practical operation, it is possible to vary the frequency slightly by changing the value of the grid resistor, but this should be adjusted for the best, purest and cleanest note. Changes in frequency should be obtained by changing the value of the coil or capacitor or by using entirely different tuned circuits. Fig. 1 shows the circuit as actually used. A four-channel tone section which modulates an oscillator generating a radio-frequency carrier of 50-54 mc was required. The unit was to be battery-operated, using not more than 135 volts for B-plus and has a power output of approximately 1 watt. To meet these requirements, two 3Q4's were used. The audio oscillator-modulator section uses one as a pentode while the rf section uses the other triode-connected. The value of the grid resistance was varied from 5,000 to 50,000 ohms and the frequencies generated range from 600 cycles to 3,200 cycles. A separate tuned circuit is used for each tone. The keying switches are placed between the grid and the ends of the coils. A 47,000-ohm grid resistor gave the best operation over the whole range with voltage variations from 75 to 135. The rf section is modulated by connecting the plate of the rf oscillator through a radio-frequency choke and small bypass to the plate of the modulator tube. B-plus connects only to the center tap of the transformer and the screen of the audio oscillator-modulator tube. Fig. 2 - Another way of arranging tuned circuits in oscillator-modulator. The tuned circuits are built around Chicago NSI-1 0.8-h and NSI-2 2.4-h coils. It is possible to use one inductance and switch various series capacitances into the circuit to obtain the required tones. The sharpness of the resonance, however, is a function of the choke's reactance. Thus, the use of one choke for the entire range means that the Q varies and the accuracy of the tone along with it. The Chicago chokes are listed as they have a minimum Q of 20. However, less expensive units, such as the Stancor C2328 (0.8 h) and the Stancor C2334 (2.8 h) may be used. Using either a single choke or the less costly chokes will result in some degradation in the frequency stability. This will be small when applied to tuned-circuit receivers, but important with tuned-reed units. The best stability and ease of adjust­ment would be with variable-inductance chokes, like UTC's VIC types, using a separate unit for each frequency. A simple adjustment of the core would set up the proper tone for transmission. Of course, this is the most expensive method. where C is capacitance in farads, L is inductance in henries and the frequency is in cycles per second. where C is capacitance in microfarads, L is inductance and frequency is in cycles per second. Therefore, you might use a single coil and several values of capacitors to obtain the different frequencies or use two coils, one 2.4 and one 0.8 h, the smaller for frequencies above 1,000 cycles and the larger for frequencies below that. Fig. 2 illustrates this arrangement.